Understanding Physics for JEE Main & Advanced authored by Mr. D.C. Pandey has become a synonym with success in JEE Main & Advanced. Waves & Thermodynamics of Understanding Physics Seriescovers waves and the wave motion and the concepts of the thermodynamics in an effective and easily comprehensible way. 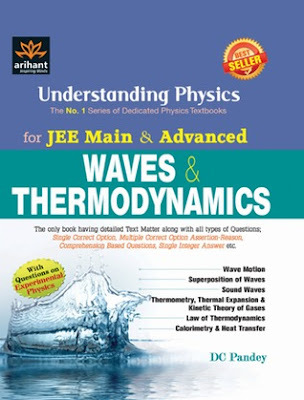 The book has been divided into six chaptersWave Motion, Superposition of Waves, Sound Waves, Thermometry, Thermal Expansion & Kinetic Theory of Gases, Laws of Thermodynamics and Calorimetry & Heat Transfer,each focusing on concept building & application of the concepts in solving varied physical problems based on the concepts. The book contains detailed Text Matter along with all types of questions like Single Correct Option, Multiple Correct Option, Assertion-Reason, Comprehension Based Questions and Single Integer Answers. The practice exercises in the book have been divided into two sections i.e. JEE Main and JEE Advanced. The book also includes questions on Experimental Physics and ‘Hints & Solutions’ section at the end.